Coolstructures panels for clean-rooms and buildings give designers, contractors, and building owners the flexibility they need to develop buildings or rooms that can be maintained to high standards of cleanliness. A temperature-controlled pharmaceutical storage room for containing temperature sensitive pharmaceutical substances must be maintained within a range of temperatures to avoid diminishment of potency or shelf life. 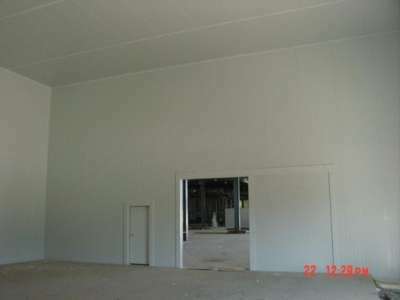 Coolstructures clean-room panels are a variant of our standard structural insulated panels so provide comparable structural and thermal attributes. Yet they are designed and manufactured with laminates and coatings that that have smooth surfaces, do not collect contaminates, are resistant to mold and corrosion, and withstand frequent washdowns. Plastisol and stainless steel are common skins over the insulation. Over the past 20 years, Coolstructures has developed an advanced insulated building panel system with high "R" values. These clean-room INSULATED PANELS offer unsurpassed thermal efficiency, they are easy to install and offer the lowest cost per "R"of any similar panel product. With Coolstructures panel products you save $ today and tomorrow. Applications include walk-in coolers/freezers, cold storage warehouses, food processing and storage, floral storage and transportation, pharmaceutical, and similar rooms or buildings where cleanliness is a must. Whether walls, floor, or roof insulated panels are required, Coolstructures can provide the ideal customized building solution.